Its opening weekend has been reported as a letdown at the box office, but onscreen, this new Australian film is anything but underwhelming. Drift has the all the realism and heartache we expect from local storytelling, and supporting the Australian film industry is only a fringe benefit of forking out for a ticket. The film opens with Kat Kelly (Robyn Malcolm) leaving her husband and taking her two boys with her, driving across the country in search of a better life. They end up in a Western Australian surf town, where the boys grow up and develop their passion for surfing. One afternoon, big brother Andy (played in the early scenes by Sean Keenan) has a scare out in the waves and Jimmy (Kai Arbuckle) rescues him. The accident gives Andy a bad ankle for life, but fixing his board with their friend Gus (Harrison Buckland-Crook) is the beginning of something very important for the Kelly boys: a love for making surf gear. The film then skips forward, and the remainder is set in the 1970s. Andy, now played by Myles Pollard, is working in a mill and younger brother Jimmy (Xavier Samuel) is a local surfing star. Gus (Aaron Glenane) is still hanging around, and the boys meet surfing nomad JB (Sam Worthington) and his beautiful companion Lani (Lesley Ann-Bandt), who have set up camp by the beach. There is instant attraction from both brothers upon meeting Lani, and she soon begins a relationship with Andy. Life is going along okay, but Andy yearns for more. Inspired by Kat’s homemade wetsuit for Jimmy, he decides to turn down a promotion at work and risk it all to start a surf gear business. It’s an ambitious plan, and the local bank manager is not convinced. It seems that everyone in town is determined to see Andy and the Kelly family fail, including the police and a particularly nasty bikie gang headed by Miller (Steve Bastoni). To make matters harder, Gus finds a weakness for heroin and loses his way, putting everything the Kelly team are working for in jeopardy. Even Andy and Jimmy’s relationship is strained, and everything starts to fall apart. Despite the hardship that all of this brings, Andy never loses sight of his goal and stays determined to bring something new and original to the surfing industry with his little family company, Drift. While Worthington is the big-name Aussie star who has made a name for himself in Hollywood, it is undoubtedly Pollard who shines the brightest in this film. In playing Andy, he portrays a man fighting not just to stay afloat, but also to make something real and worthwhile for himself and his family. He is flawed, losing his temper and falling victim to tunnel vision at times, but these flaws are all part of what makes the film so raw and gives it such a sense of realism. The best characters in movies are the ones that you can’t help but think about after leaving the cinema, and Andy is one of these characters. Beyond the storyline, this film also has a lot to offer visually. The switch from black and white to colour as the story skips forward ten years is a clever and effective device to mark the change in the characters and the life they are leading. Not knowing much about surfing, I can’t tell you if the surf scenes were technically impressive, but they were certainly impressive to a casual observer. The huge glassy waves of Western Australia look great on the big screen, and the crashing swell adds a sense of drama to all the surf scenes. At the heart of this film is a story of a person who had faith in a dream, and believed despite all obstacles that staying to true to this dream would lead to bigger and better things. It is also a story about family and loyalty, particularly the intense and powerful relationship between Andy and Jimmy. 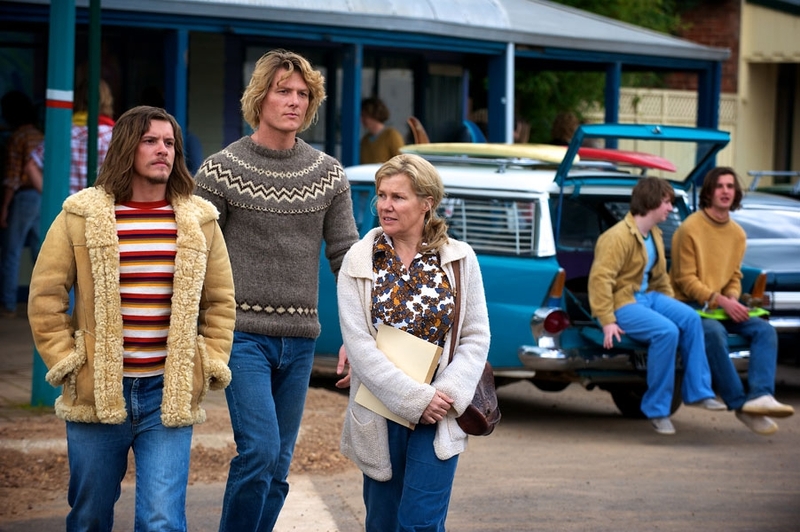 There is also a historical element to the film, with its depiction of 1970s surf culture and life in a small town in the 70s.While it may not draw big crowds, it is a success in the sense that it tells a memorable story and gives life to wonderful characters. Lovely review of a wonderful film. One point: it’s Xavier Samuel, not Xavier Maxwell. This entry was posted in Culture, Film, Opinion and tagged Drift, Myles Pollard, Sam Worthington. Bookmark the permalink.